Born and raised in a suburb of Long Island, New York, Dr. Cabebe, decided after graduating from high school to attend the University of California at Los Angeles to not only be closer to more extended family but to enjoy not having to shovel snow during the harsh winters! He then went on to dental school at the University of the Pacific in San Francisco. 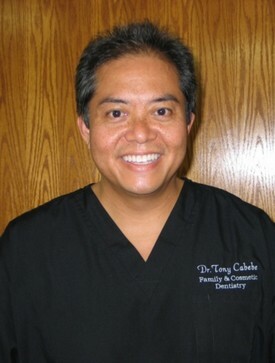 Dr. Cabebe has since treated patients from throughout Ventura county for over 20 years. He is a member of the American Dental Association, California Dental Association and the Santa Barbara-Ventura County Dental Association. He has two adult children. His hobbies include cooking, especially barbecuing, working out and golf. He also attends Crossroads Community Church in Camarillo.